With bronzed skin and slightly light heads, we made our way back to our room to freshen-up. Each guest room at the Four Seasons is equipped with a large bath, a beautifully tiled shower and a proper-sized vanity for the two of us to share. L’Occitane bath products that helped rejuvenate our skin and spirits are standard for every room and villa at the Four Seasons. I could not remember the last time I felt so relaxed and at peace. While Severine finished primping for dinner, I ventured out onto the terrace to take in the view and admire the streaming colors of sunset that were awash in the evening sky. The front desk offers the service of door-to-door transportation for those who do not wish to make journey to the restaurants and pool areas on foot, but we decided to casually stroll, taking our time getting to the dining room for our reservation. That night we had the option of dining on the more casual side of the terrace that served the same mouth-watering delicacies as we enjoyed for lunch, or the gourmet end of the terrace. What good would this report be if we did not try both? We began with freshly prepared Foie Gras, that was soon followed by Severine’s plate of John Dory. I enjoyed the rabbit prepared three different ways. Each main course was presented with perfect al dente, sautéed vegetables. After dinner, we were served two short glass cylinders of raspberry sorbet with framboise poured over the top. This palate cleanser was a welcome accompaniment before this evening’s final course, dessert. Dessert consisted of a ramekin of the silkiest crème brûlée I had ever tasted. Afterwards, our waiter brought us each a small plate with a few locally made chocolates and candies. All of this feasting set the stage for a walk back to our room under the Monet-like canopy of stars and silvery trees that glowed in the moonlight. 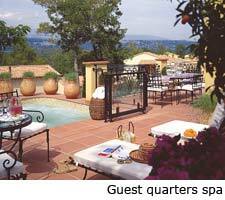 The next morning we awoke to the delicate maraca-like chatter of the cigals; Provence’s cricket. I walked to the terrace, enjoying the sunrise over the mountains as birds fluttered from their resting places in search of their morning meals. Silently passing by below were the occasional room service golf carts delivering breakfast. All was right with the world at that very moment; at least it felt that way. During our stay at the Four Seasons Provence, my wife and I rediscovered a beauty not only within ourselves and our relationship, but within the world around us. As human beings, we have a tendency to become overly consumed with our daily lives and their hectic schedules. When we take the chance to step outside of that regimen, we may find a freedom and joie de vive that was once lost – or temporarily stashed away. 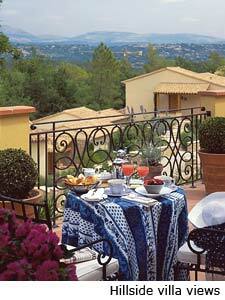 The Four Seasons Provence is one of those places where ancient charm and character are ingeniously intertwined with modern décor and genuine courtesy; creating an escape that is fit for couples, families, and even corporate meetings. If you are looking for a vacation full of loud noises, busy streets and a general lack of humanity, do not come to the Four Seasons Provence. 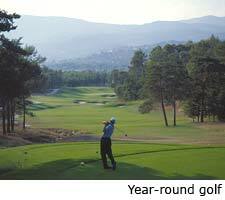 But, if you are the type of person who enjoys long days by the pool, friendly games of golf on two professional courses, trips into charming villages that are nearly as old as the mountains they rest upon, and rediscovering the meaning of being human, then make your reservations now for the birthplace of dreams and wonderment, the Four Seasons Provence.